The art of Muay Thai, often referred to as “The Science of Eight Limbs”. As the hands, shins, elbows, and knees are all used extensively in this art. A master practitioner of Muay Thai thus has the ability to execute strikes using eight “points of contact,” as opposed to “two points” (fists) in Western boxing and “four points” (fists, feet) used in most sport-oriented forms of martial arts competition. In Thailand, Muay Thai’s original home, it has become a National Sport in which opponents regularly fight in front of spectators for entertainment. In its original form, Muay Thai actually consisted of an arsenal of nine weapons – the head, fists, elbows, knees and feet. Although in modern Muay Thai, both amateur and professional, head butting is no longer allowed. With the success of Muay Thai in mixed martial arts fighting, it has become a popular choice for competitive stand-up fighters. As a result, it has evolved and incorporated much more powerful hand striking techniques used in western style boxing. Note: When Muay Thai fighters compete against fighters of other styles (and if the rules permit it), they almost invariably emphasize elbow and knee techniques to gain a distinct advantage in fighting. 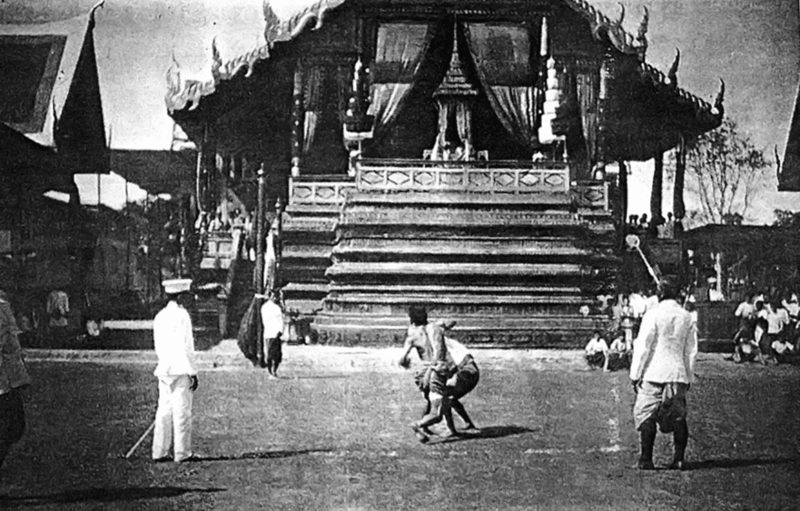 Muay Thai has been practiced for centuries, but it is only in the last 20 years that it’s popularity reached every corner of the world. Nowadays, Muay Thai is recognized globally as the world’s hottest ring sport. It is also a part of elite military and law-enforcement training all over the world. Muay Thai is also making strides to become a future Olympic Sport. Fitness: Do you want to get in the best shape of your life? Thai boxers are known as some the best conditioned athletes in the world. Imagine how great you will feel when you lose all the weight you want, tone your muscle mass and have fun while doing it. It’s the toughest work out you’ll ever love. Effective Self-defense: Muay Thai is a powerful stand-up martial art. It is quick and effective as the best way to learn how to move your body with balance and power. Muay Thai has a no-nonsense approach to self-defense. All the techniques are practical for defending yourself. When you know how to defend yourself you will walk with confidence. When you walk with confidence people will know you are not a target. Fun: Tired of running on the treadmill? Tired of the same old routine? Muay Thai is a blast! You’ll get the fitness results that you’ve always wanted, surrounded by positive people in a clean, safe, healthy atmosphere. Fighting spirit: How would you like to have boundless confidence? Muay Thai generates mental focus and self-assurance that will enhance all areas of your life. Feel the inner strength, see the external results. Train with a fierce heart and spirit…develop a “Non-Quitting Fighting” spirit! We promote non-violent resolutions to conflict. Students will learn confidence, self-discipline and control as they learn how to act and react to the world around them. Our young students are treated with respect and are taught to return the same respect to others. We believe in praise, encouragement, and positive reinforcement. We have incentives for good academic report cards and students must maintain good academic grades for promotion to a higher rank. We teach students the value of setting goals and achieving them.